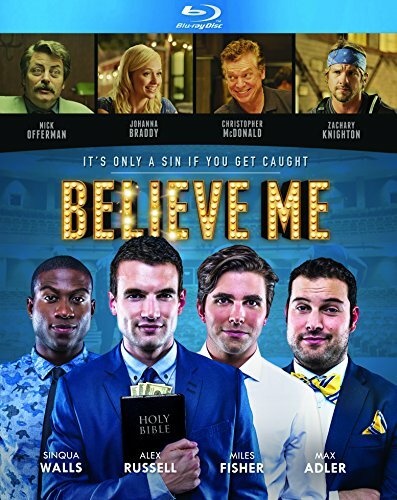 Four college seniors set out to scam good-hearted churchgoers in Believe Me , the sharp-edged feature debut of writer-director Will Bakke. The acutely observed comedy about the true power of faith comes to Blu-ray and DVD on March 3, 2015, from Virgil Films. Sam (Alex Russell, Unbroken, The Host, Carrie) stands on stage as thousands of fans go wild. Smart, charismatic and handsome, he moves them with his message, and when he calls for donations to his charity, the money pours in. The only thing is, Sam doesn't believe a word he's saying. Just months earlier, Sam was a typical college senior focused on keg stands, hookups and getting through graduation. But when a surprise final tuition bill threatens his dream of law school and leaves him thousands of dollars in the hole, he's forced to think outside the box. Convincing his three roommates they can make a killing exploiting the gullible church crowd, Sam starts a sham charity to bring clean drinking water to Africa. The guys begin campaigning across the country, raising funds for a cause as fake as their spiritual message. For Sam, embezzling money is easy compared to getting attention from the person he cares about the most. When Callie (Johanna Braddy, Easy A, Paranormal Activity 3), the tour manager and the object of Sam's affection, finally uncovers the guys' ruse, it's Sam's moment of truth. On the final night of the tour, before a packed auditorium but alone in the spotlight, it's time for Sam to decide what he really believes. Also in the cast of this inspriring comedy drama are Nick Offerman (Parks & Recreation, We're the Millers), Max Adler (Glee, 23 Blast), Christopher McDonald (Happy Gilmore, Boardwalk Empire), Zachary Knighton (Happy Endings), Miles Fisher (Final Destination 5), Sinqua Walls (Shark Night 3D, Power) and Grammy Award winner Lecrae. Mark Moring of Christianity Today wrote, "Believe Me takes aim at modern evangelical tropes and trappings -- worship, prayer, jargon, missions, revivals, and even 'Christian apparel' -- with just the right blend of snark and kindness. ... As the credits roll, you'll still be smiling while also thinking deeply about your faith, your habits and practices, and issues of integrity in the church." "A remarkably smart, funny, brave and heartfelt first feature film -- Bakke has a sharp eye but a warm heart and a refreshing honesty," said Nell Minow of Beliefnet. Jeannette Catsoulis of The New York Times called Believe Me "a smart, sly comedy about what its director, Will Bakke, calls 'the power of platforms.'" Rich Cline of Contactmusic.com said, "A knowing, very sharp script gives this comedy a very strong kick as it tells a story about interlopers in America's Christian subculture."